I hesitate to say something over-dramatic like “Age of Apocalypse changed my life,” but Age of Apocalypse CHANGED MY LIFE. When I started getting into actually reading comic books, A of A was the first collection of trades I bought and read. I spent a winter reading one issue before bed (let’s be honest – one quickly became six before I could say “you’ve got class in the morning you fool!”). Well, I’ll just let you read it. In anticipation of X-Men: Apocalypse in theaters, Marvel has reissued several new trade collections of the Age of Apocalypse saga. Below you’ll find the trade reading order, as well as the issues included (in order). Note that if you already have the old collected trades, these new printings offer the same issues, albeit in a different reading order. Most notably, the first volume of AoA collects Legion Quest as well, making it a substantially more logical starting place. Ok – hear me out. Age of Apocalypse: Dawn is a prologue trade that chronicles The Astonishing X-Men and Apocalypse’s rise to power. In short this trade collection offers a number of flashback comics that chronologically occur prior to our first view of the Age of Apocalypse universe in X-Men Alpha #1. So why not read it first? The comics in Dawn were all published after Age of Apocalypse had already started and generally assume you have some knowledge of the AoA universe. Personally, I think these issues work much better as “flashbacks,” as you take a break from the Age of Apocalypse to see how we get here in the first place. In short, I think the AoA experience should begin with X-Men Alpha #1, and not X-Men Chronicles #1. While Age of Apocalypse gets all the hype, it’s worth checking out Apocalypse as an X-Men villain inside the standard Earth-616 timeline (see also, that bad a-word villain from X-Men the Animated Series ). Note, these are not the first appearances of Apocalypse in comics (that’s next), but are a collected variety of his true beginnings, and role throughout history. I would recommend holding off on the “Further Adventures of Cyclops & Phoenix” included in this collection until after reading “The Adventures of Cyclops & Phoenix” listed below. It’s also worth noting, that the majority of these issues are not available yet on Marvel Unlimited, which will be a recurring theme for Apocalypse. In one of the stranger Marvel Unlimited gaps, Apocalypse’s first appearance from X-Factor #5 is not included in the library. Marvel’s reproducing a collected trade of these early issues from Louise & Walter Simonson, and in addition to some Jean Grey set-up in Avengers #263 and Fantastic Four #286, you’ll get X-Factor #1 to #9 and X-Factor Annual #1. 1986’s Mutant Massacre is hugely influential in a variety of ways (it essentially launches X-crossovers for the next decade), but some of the most memorable moments are cornerstones of Apocalypse’s role in the Marvel U. Another shockingly absent major X-Men crossover, with more Apocalypse action in the X-Factor comics from the majestic Simonsons. This collection will get you X-Factor #18 to #26. Issues #24 to #26 are explicitly Fall of the Mutants tie-ins. Did you hear the one about surprising misses in the Marvel Unlimited library? 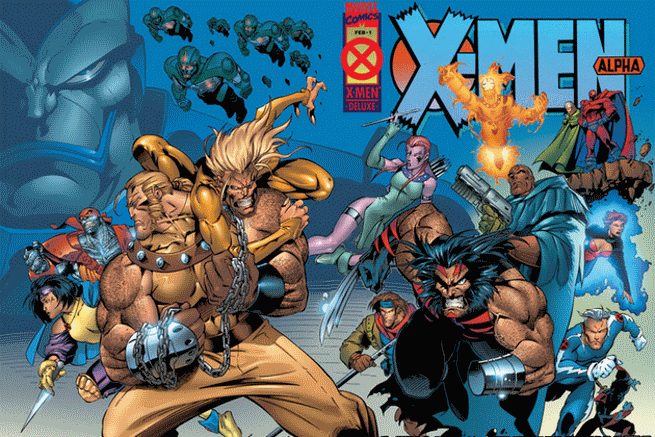 X-Cutioner’s Song – an all-time great 90’s X-Men event – might lead the pack. There’s a surprising amount of essential details in this collection, with revelations for Cable, Mr. Sinister, Apocalypse, and of course, Cyclops & Phoenix. 4 issue miniseries, included on Marvel Unlimited. It’s worth noting that “Blood of Apocalypse” occurs in the aftermath of Decimation (which in turn happens in the aftermath of House of M ). Messiah War is an increasingly underrated follow-up to the mega X-event Messiah CompleX . Apocalypse is hardly the focus, but he does play a crucial role. A must read for fans of Cable and X-Force. Rick Remender’s 35 issue run on Uncanny X-Force is one of my favorite 100 Marvel Comics since 1998, and it has major ramifications for both Apocalypse and the Age of Apocalypse Universe. The Dark Angel Saga collection will take you through Uncanny X-Force #1 to #19. Following the end of the Dark Angel Saga, a whole new portal into the Age of Apocalypse universe was opened. For the Marvel Unlimited crowd, the above three collections will take you through the 14 issues of Age of Apocalypse (2011 to 2013). Wolverine & The X-Men, from Jason Aaron and Nick Bradshaw, runs for 42 issues from 2011 to 2014. You don’t have to read all of these issues as part of an Apocalypse reading order, although as a comic fan, I’d certainly encourage you. For the purposes of “Kid Apocalypse” check out Wolverine & The X-Men #4, which introduces him to the school. Issues #25 to #35 of Uncanny X-Force are one cohesive, final storyline from Remender’s time on the title, and they effectively resolve the Apocalypse narrative started all the way back in Uncanny X-Force #1. Rick Remender’s Apocalypse Trinity continues in the pages of Uncanny Avengers, although less directly than in Uncanny X-Force. I recommend reading the entire 25 issue run for this, but you could conceivably begin with Uncanny Avengers #6, which begins the Apocalypse Twins story arc. Axis is one of Marvel’s 2014 events, and the unfortunate conclusion to Remender’s Apocalypse Trinity (don’t look that up… I’m the only person who calls it that). You can check this link for the full Axis reading order. Age of Apocalypse returns for another round as part of Marvel’s 2015 event (and personal favorite event of all time), Secret Wars ! Honestly, you can read the tie-in pretty independently of the whole colossal Secret Wars reading order, but I’d highly recommend the whole shebang. Dave’s Note (Jan 2016) – The Age of Apocalypse Omnibus is being reprinted this year, and will be released April 2016. These go out of print FAST, so if you’re interested, I recommend jumping on the Omnibus now. It’s actually less costly than purchasing all the trades separately (for the time being). For the most part, reading A of A through the collected editions is super easy. You’s pick up your trades, and you’s read your comics. The first volume of the Age of Apocalypse epic is not recommended or required reading, at least not to begin with. This is weird, I know. For some odd reason, Marvel made Book 1 the least logical starting point this side of Pride & Prejudice. You’ll have the best A of A reading experience starting from Book 2. If you don’t believe me, just check out the Amazon reviews on Book 1. Most of Book 1 is composed of limited series, and additional AoA world-building arcs, so my preference is to read it after you’ve completed Book 4 of the Saga. That said, there is now a solid Age of Apocalypse prelude that includes the set-up Legion Quest arc that launches AoA. I would start here. If you’re either collecting individual back issues (good for you!) or trying to read Age of Apocalypse through your Marvel Digital Unlimited subscription, here’s the order each issues appears in the trades. It’s far from a seamless story, but you’ll do just fine chronologically with this order. Quick note: the links below will take you to the issues you need if you are reading using Marvel Digital Unlimited. Should make it easy to bookmark the page for quick links straight to the issues. To my knowledge these issues aren’t collected in the trades, but they are available on Marvel Unlimited and provide appropriate Age of Apocalypse back story and set-up. If you like Comic Book Herald, and are able to donate, any small contribution will help keep CBH alive and full of new comics guides and content. Donate here! Or learn more about easy ways to support Comic Book Herald! Thank you for reading! I have one question. Did i miss the story of Jean and wolverine and how hè lost his hand and cyclopes his eye? I recently bought all the new AOA trades and I’m really glad I checked your reading order first! Dawn is so damn confusing and disjointed and I would have been completely lost if I hadn’t read Alpha first! It did help answer some of the questions (particularly the “Magneto and Rogue? Huh? What about Gambit? !” one), but it feels kind of like it was quickly cobbled together with random leftovers rather than a cohesive book like the rest. Are there issues that aren’t printed in the TPBs, in particular Dawn, that came out during AOA, or were some parts of the alt history deliberately left ambiguous? Hi! First of all. thank you very much for this! I wanted to ask you if there is a reading order for the period going from the end of the X-cutioner’s song (UXM 297) and the beginning of the age of apocalypse (UXM 319). Also, what happens to UXM after issue 321? Ok, I saw that UMX continues in the onslaught reading order… but what about the first question? So, could MU readers read AoA using the newer trade collection issue order, or do we need to follow the MU order? Ok, so if we’re following the guide of where to start in 2016 ( https://www.comicbookherald.com/best-marvel-comics-to-start-with-2014/ ) and we get to the age of apocalypse part, and we really really do love the x-men but we also kinda want to get on with our lives, where would you recommend we stop on here? X-Men Omega #1 – enjoy the comics! Hey, Dave! On The Twelve reading order I noticed it says X-Man #5. I’m assuming you meant #59 correct? I’m not saying this conclusively as I have yet to read the story arc. Thanks! Can you post the Age of Apocalypse: Twilight Reading Order up soon? I know it was only released on Tuesday but I’m really anxious to read it. What is the difference between the X-Men Age of Apocalypse Omnibus (2016) & Age of Apocalypse Dawn, 1,2,3,Twilight? Does the Omnibus have Dawn and Twilight included? Has anyone compared the quality of the new edition TPBs to the old ones? I have the original Complete AOA Epic TPBs, but am tempted to check out the new ones too. Any reason to do so or I am good to go with the old ones? Love the site. Keep up the great work! What is the New Age of Apocalypse Dawn comic going to be about? And where does it fit in with the latest volumes released? Dawn will, in theory, come before Volume Alpha. I’ll slot it in once the trade is released! Awesome! Thanks so much for all the information you your site delivers! The AoA Omnibus reprint is coming out in April. Would you suggest reading this instead of the Complete AoA Epic vol 1-4? I already have the Prelude but looks like vol 3 will be too expensive to obtain. Can I just jump into this saga no problem if I’m completely new to X-Men in general? I’d love to read it but I’m not very up to speed with X-Men.. If at all. :L Can I jump straight in and come out understanding everything? If you’re completely new to X-Men, I would really recommend checking out the Chris Claremont era – that kind of defines everything from the mid-70’s to present. After reading 2005’s New Age of Apocalypse I decided I was doing myself a disservice by skipping AoA. I’ve got Marvel Unlimited and am trying to follow what’s happening but I’m really confused. I read X-Men Chronicles #1, then start #2 and the X-Men are fighting about Jean Gray being abandoned and Logan’s missing a hand. So I stopped and read Alpha but Jean and Logan are on Sinister’s side and Nemesis is Holocaust, and we got Baby RoNeto. Should I just find the Legion Quest books before going any further or is this just how AoA is, like a Tarentino movie? Thanks for what you do! What helped me out was that i took it for what it was, an alternate universe where everything has existed away from our vision. I could not find myself any backstory to explain why the teams were together and thats ok.
OK, OK. I admit it. I used a different list for reading AoA. And it has Age of Apocalypse: The Chosen in a very different place. One of the reasons I didn’t care for this event is that it had a whole bunch of different characters that I wasn’t familiar with thrown at me all at once. Even the familiar ones were unfamiliar (I trust you know what I mean). Anyway, this list – for some reason – has The Chosen between issues #2 and #3 of the various series. The very reason I chose this other list is because I DID want some background going into it and this suggested order seemed to have it, including the AoA one-shot, Tales of…, X-Man minus 1 (couldn’t find anything about this ANYWHERE), X-Man Annual #1 and the Blink mini-series. But alla this didn’t explain why there was a need for all these different groups. The Chosen didn’t change that, but it does kinda explain what the groups are. And on what side. So now I feel kinda unloyal n stuf. And I’ll never do it again. Really no such with Age of Apocalypse. Unlike contemporary events, Age of Apocalypse had no “Core” series. Thanks for this! It seems, however, that the links do not work. Its not such a huge deal but thought you should know if you don’t already. I thought I’d refresh myself in preparation for AofA Battleworld. Have fun! Links appear to be working on my end – if you have one that’s busted and wouldn’t mind sharing, that’d be much appreciated! Actually it has 4 toward the end of the reading order. It does start with 1-3 and then chronicles 1-2. But I’m not to sure chronicles 2 belongs there so who knows if they got the blink series correct. I don’t think it matters much because it appears to only take place in the negative zone. I haven’t got to issue 4 yet but I can tell you that’s the case for 1-3. AoA is where I jumped back into comics (via MU) after 20+ years away from comics. great guide, but there is some tie-ends after X-Men Omega? Omega is followed by Xmen Prime. It takes you back to the Xmen under Charles Xavier having stopped his death by Legion. I can not express enough though to all these fan boys that the upcoming movie will have nothing to do with AOA. Charles Xavier would have to be murdered prior to forming the Xmen in order for that to happen, and there’s been no movie where he has. Enjoy. Prime also shows Xman falling to earth and the psychic backlash that it causes on the telepath community. For some reason age of apocalypse complete epic book 3 is out of print, but 1,2,and 4 are not. I have been trying to get it for months, but while the others are around 20 bucks each, Book 3 is a minimum of 80 bucks and higher! I don’t get why a graphic novel can be so expensive!! frustrating. ..
Out of print books get pretty crazy, pretty fast. I’d be pretty surprised if this book doesn’t see a reprint given 1) the Age of Apocalypse popularity and 2) the impending Age of Apocalypse based X-Men movie. That said, there are all sorts of weird politics going on between Marvel and Fox Studios with the X-Men rights. So… who knows. In the meantime, just for the story I’d shoot for 1) local library copy or 2) Marvel Unlimited or 3) Comixology. Not a substitute for the trade experience, but a workaround. Does the AoA Omnibus Companion cover Books 1-4. I know the original AoA Omnibus doesn’t but was wondering if the Omnibus Companion does. Also, is there a good reference point for X-Men collection editions – The Marvel website is horrible! Where would X-Men Chronicles fall into? Also, wouldnt a good lead into be the Legion Quest storyline which causes AoA? Great call, guide now updated to reflect Legion Quest! Chronicles 1 is the first book you should read. It details alot of stuff prior to Alpha. Chronicles two you can kind of throw in anytime after Alpha! So, if you were planning on reading AoA, is Book 1 worth it, and will it make the story confusing if you don’t read it? Or will it be the same either way? The movie will have nothing to do with AOA! AOA is a “What If” type series revolving around an event where Prodessor X was accidentally killed before he could form the Xmen. I admit I am coming to AoA late by trying to collect the four Trade paperbacks. I have successfully found 1,2,and 4 but I can’t find 3 to save my life. Do you know if Marvel is going to republish these trade when the movie comes out? Don’t know for sure, but I’d be pretty surprised if these trades weren’t reprinted. AoA is hugely popular, and the omnibus has been out of print for too long as well. So when should you read book one? Thanks for the list. What a great story. Love me some Age of Apocalypse. Glad you enjoyed! THIS IS SO AWESOME. For a long time people have been wanting to get into comics but couldn’t because all the stories, events, crossovers, and blah blah blah have been so all over the place no one knows where to jump in! And Marvel tried saying start at Marvel NOW since it’s a bunch of number ones and stuff like that but this website and it’s guides are FRICKEN AMAZING. I used to watch youtube vids for Marvel Event stories but now I can actually READ Age of Apocalypse instead of listen to someone tell me what happens. Glad you dig it! It’s a fun read, enjoy! You left out the two X Men Chronicles. And not entirely sure what the TPB volumes are. TPB is short for “Trade Paper Back.” A TPB is a number of comics collected together in one paperback graphic novel. It’s usually a cheaper alternative to buying comics individually, and (usually) doesn’t contain as many advertisements as the regular single issues. An example is if “Comic X” has 21 issues, they might print them as a TPB called “Comic X” Volume #1 (1-7), #2 (8-14), and #3 (15-21). What the writer of this article is saying in his comments are this: if you intend to buy the TPB volumes, save AoA Volume #1 for LAST. Small question about the first volume. What exactly is wrong with it? Is it confusing or simply not enjoyable? A little bit of both. For me it’s more the fact that it’s a lot of prelude/companion piece to Age of Apocalypse – I prefer diving right in to the alternate world. That said, if you really like Age of Apocalypse, these can make for some fun additional reading – I just wouldn’t start here. Marvel unlimited has a suggested reading order, it’s layout is different of their typical chronological order they usually do, it looks pretty legit. So I have a couple questions…chronicles 2, should it be read after 1? I’ve heard it should be read after alpha but see it is after chronicles 1 on the list. My second question is the unlimited has issues 1 and 2 of some of the series read one after another. It’s the same as your list until gambit series then it does 1 then two, then same again for weapon X, amazing, and factor X. Then finishes the 2’s from first few series. What’s your opinion on this? Did you end up reading this via Marvel’s reading order or this list? I’m eager to start A of A and am leaning towards Marvels suggested reading order.